The first historic Opscode Community Summit is officially over. See yesterdays post for a basic description of the event and structure. There’s more, but I lost track due to poor note taking on my part. By far the biggest announcement to come out of today was the fact that Hosted Chef is moving from Ruby+NoSQL to Erlang+MySQL. For Opscode it boils down to using the right tools for the job and after a hard look at how Hosted Chef is being used it’s clear this change will be for the better. Erlang brings a ton of cool benefits and I look forward to hearing about their migration path from the current platform. Lots of nice performance graphs accompanied this discussion, led by Chris Brown and Kevin Smith from Opscode. Sean Porter led a discussion about monitoring and the how the community is using the myriad of tools available to us. Basically monitoring is hard and has subtle challenges at scale in current implementations. He showed off sensu and discussed ways for possible collaboration with the community. I hope to dig in to this a little more since I’ve been thinking about problems in around monitoring, metrics and alerting for a little while lately. 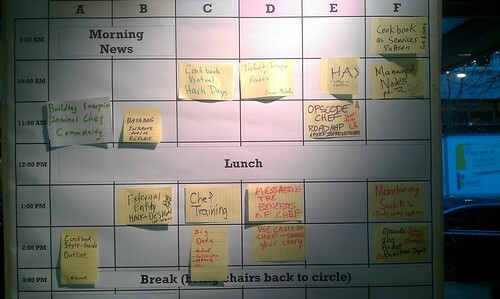 Overall what I most enjoyed about the summit is the sense of community that is clearly maturing around chef. With so many passionate people and hard problems, there’s bound to be some neat things on the horizon. It’ll be exciting to see what the next year holds in store for Opscode and the chef community.